Nokia C3-00 keypad jumper waysNokia C3-00 keypad solutionNokia C3-00 keypad 147 solutionNokia C3-00 keypad ic jumperNokia C3-00 keypads e d c p solutionNokia C3-00 3,6, 9 keypads solutionNokia C3-00 keypads problem solution. Most people cannot do without the so called "Nokia ", but the question is how do you care for the phone? the durability and rigidity of old Nokia phones make the stand out of crowd. Did your C3-00 Phone drop in liquid is a common thing and what follows next. Below is the easiest way to fix the keypad problem especially Nokia C3-00. How to repair Nokia C3-00 all keypads problem this solution can also work on Nokia X2-01. Disassemble or take apart the Nokia C3-00 phone. After check, if it doesn't work. Then grab your soldering iron, paste and lead. 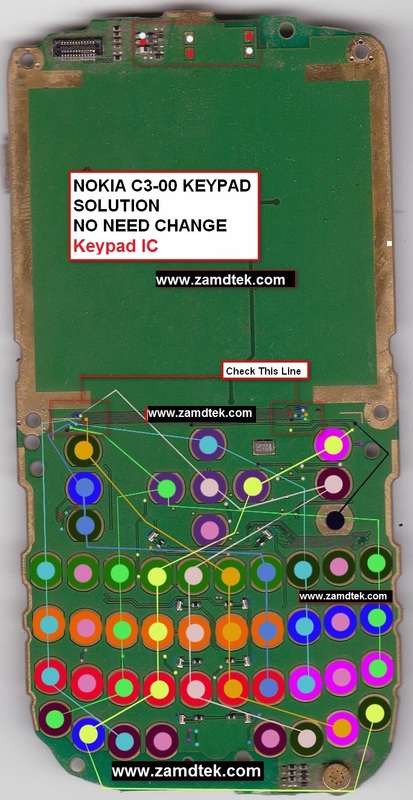 The diagram explain the details of how to fix the keypads problem. But care should be taken because the keypad points are made of carbon instead of copper. You should use tapper and connecting wires instead of soldering iron and lead. Fixing this kind of problem can cuase another problem because if you mistaken erase the carbon coated keypad points then you cannot get it back. Nokia 130 keypad 100% solution.